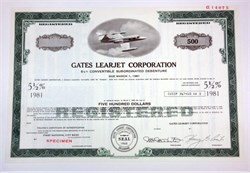 Beautiful engraved RARE specimen certificate from the Gates Learjet Corporation printed in 1975. This historic document by the Security Columbian Banknote Company and has an ornate border around it with a vignette of the world's first true business jet aircraft, the Lear Jet Model 23. When Lear came up with the idea for a non-commercial jet plane, everyone thought he was crazy. His first jet could only carry 2 passengers. This item has the printed signatures of the Company's President and Treasurer and is over 42 years old. The starting point for what became the very symbol of the "biz jet" started life as an abortive attempt by a Swiss aircraft company to build a new ground-attack fighter aircraft, the FFA P-16 of 1955. Although this effort proved unsuccessful and by 1960 efforts to produce the warplane had ceased, the basic structure of this aircraft was seen by Bill Lear and his team as a good starting point to the development of a business jet, which was originally intended to be called the SAAC-23. The wing with its distinctive tip fuel tanks and landing gear of the first Learjets were little changed from those used by the Swiss fighter prototypes. The tooling for building the aircraft was purchased and moved to Wichita, Kansas, United States, in 1962. On February 7, assembly of the first Learjet was begun. The next year, the company was renamed the Lear Jet Corporation. The original Learjet 23 was a six to eight seater and first flew on October 7, 1963, with the first production model being delivered in October 1964. Just over a month later, Lear Jet became a publicly-owned corporation. 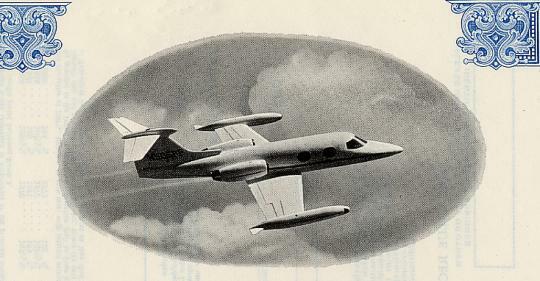 Several derived models followed, with the Learjet 24 first flying on February 24 1966 and the Model 25 first flying on August 12, 1966. On September 19 of the same year, the company was renamed Lear Jet Industries Inc.
On April 10,1967, all of Bill Lear's assets � he held approximately 60% of the company (US$27,000,000) � were acquired by the Gates Rubber Company of Denver, Colorado, United States. However, he remained on the board until April 2, 1969. Later in 1969, the company was merged with Gates Aviation and the company name was changed to Gates Learjet Corporation. In 1971, the first Model 25 powered by a Garrett TFE731-2 turbofan engine was flown. This aircraft later became the successful Learjet 35. That year, the company was awarded the President's "E" Award for promoting export sales. In 1984, the Gates Learjet Corporation announced the start of their Aerospace Division, a high technology endeavour. However, by the end of the year the company had ceased production of its commercial jets in an effort to reduce inventories. This lasted until February 1986, when the company headquarters were transferred to Tucson, Arizona, United States, and production was restarted both in Wichita and Tucson. On September 10, 1985, the Aerospace Division was awarded a contract to produce parts for the Space Shuttle's main engines. In 1987, the Gates Learjet Corporation was acquired by Integrated Acquisition, Inc. and the next year the name was changed to Learjet Corporation. By January 1989 all production had been moved from the Tucson facility back to Wichita. The next year, 1990, Bombardier Aerospace purchased the Learjet Corporation. The aircraft were then marketed as the "Bombardier Learjet Family". Learjet 35 � LJ35 (Learjet, Gates Learjet & Shin Meiwa). Known as the C-21 in U.S. Air Force service. Learjet 36 � LJ35 (Gates Learjet). Basically a Learjet 35 with increased range. This increase is possible through the removal of two seats for an extra fuel tank. On October 25, 1999, Payne Stewart and several others (Jerri Gibbs of Leader Enterprises of Orlando, and Robert Fraley and Van Ardan, officers of Leader who acted as agents for Payne Stewart, and the pilots, Michael Kling, 43, and Stephanie Bellegarrigue, 27) were flying a Learjet 35 designated N47BA from Orlando International Airport to Dallas-Love Field Airport. The plane suffered a loss of cabin pressure, which was not acted upon by the flight crew. Jacksonville's Air Traffic Control Center attempted to contact the plane and got no response. The jet continued to fly over several states on autopilot until all fuel was exhausted. It is estimated that all aboard were dead from hypoxia before the plane left the Florida radar. The plane crashed ten miles west of Aberdeen, South Dakota. Later, Learjet was cleared of responsibility in the accident. On May 2, 2000, race driver David Coulthard survived a Learjet 35 crash. The chartered plane in which he was travelling from Farnborough Airfield to C�te d'Azur International Airport developed engine trouble, and crashed while attempting an emergency landing at Saint-Exup�ry International Airport near Lyon, France. While Coulthard received only minor injuries, the front of the aircraft disintegrated upon impact, killing both pilots. On June 2, 2006 a Learjet 35 registered to Christian televangelist Pat Robertson crashed a half-mile short of the runway at Groton-New London Airport in Groton, Connecticut. Both pilots were killed, however the three passengers aboard escaped without injury. Robertson was not aboard the plane.